The total ambient concentration of aerosol particles larger than the threshold size for the instrument, typically about 11 nm diameter (6 nm for the water-based counter), but dependent on flight conditions. Condensation nuclei are particles that serve as condensation centers when exposed to high supersaturations of some condensible vapor such as butanol or water. They are normally detected by exposing the airstream to such a supersaturated vapor and then detecting the resulting droplets after they grow to sizes where they are readily counted by, e.g., an optical counter. The supersaturation used is typically about 300%. Currently the only condensation nucleus counter in use by RAF is a butanol-based TSI 3760A packaged with a pump, pressure gauge, temperature sensor, and mass flow meter. 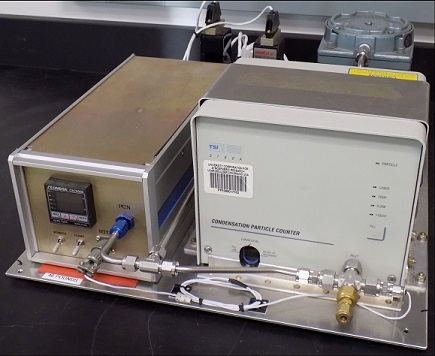 A modified version of a TSI 3786 ultra-fine water-based CN counter, which has flown in the past, is no longer requestable. Because the 3760A counting efficiency drops rapidly with pressure below about 250 mb, it is unsuitable for high-altitude measurements aboard the NCAR/NSF GV. Particles flow continuously through a small internal chamber where they are counted, and concentrations are then determined by dividing by the volume flow rate. RAF data processing then converts the measured instrument concentration to equivalent ambient concentration (not to standard conditions). The threshold (50% efficiency) particle size detected by the butanol instrument is about 11 nm, although this varies somewhat with pressure. The data processing also includes a correction for particle coincidence in the detection volume, which becomes increasingly important as particle concentration increases. With this correction, the instrument continues to perform with uncertainty < 10% up to concentrations around 10,000 cm-3. Tubing losses can be significant for small particles, and size-dependent and pressure-dependent errors may become significant unless the lines can be kept very short. Sources of CN in the atmosphere include combustion by-products (soot), wind-generated dust, sea spray salt, gas-to-particle reactions, residues from in-cloud aqueous chemical reactions, etc. Atmospheric removal of CN occurs primarily through growth to larger sizes by coagulation with other particles, gravitational or inertial settling, and (dominantly) scavenging by clouds. Typical concentrations of CN are ~100 cm-3 in clean background air and ~5,000 cm-3 in cities, with peak values > 50,000 cm-3. Virtually all C-130 projects use the butanol-based instrument. It is included as a standard measurement.